It is with a heavy heart and a respectful hand that I write this. 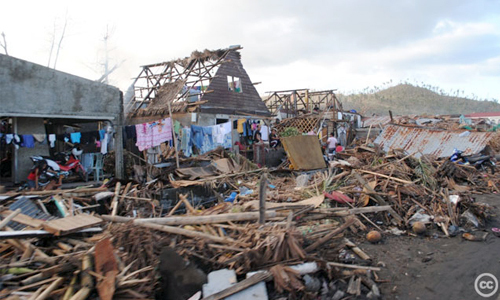 Super Typhoon Haiyan has only just passed, and the devastation cannot yet even be fully understood. With that in mind, please consider a donation to the Philippine Red Cross. But that will only aid those impacted by this storm. Not the next. Or the one after that. This was the feeling captured by Yeb Saño, the Philippine's lead negotiator to this year's United Nations Climate Talks (COP). As he tearfully pleaded with the delegation gathered in Warsaw, Poland, he powerfully pressed them for action and challenged those who stand it its way. He dared those still unconvinced by the need for climate action to do a little sightseeing, and take in the impacts of rising sea levels as they surge inland in front of storms, of melting glaciers as they flood the land they once nourished, of drought-induced famine as it destabilizes weak nations and of unprecedented hurricanes and typhoons that have pounded the U.S. and Asia alike. The unusually deep, unusually warm pool of water that provided the initial fuel is unlikely to have existed in a world without warming. Global warming-induced sea level rise contributed to the 20-foot storm surges that caught victims off guard, much as it contributed to Sandy's record 13-foot coastal surge that flooded substantial sections of New York and New Jersey. These events would not have been as severe in a world without warming. But herein lies the crux--we no longer live in a world without warming. Given that 1985 was the last year with temperatures below the 20th century average, and 2000-2010 was the hottest decade on record, it has become impossible to say for certain that any given storm is free from the influence of our warmed world. We can take drastic action now to ensure that we prevent a future where super typhoons are a way of life, because we refuse, as a nation, to accept a future where super typhoons like Haiyan become a fact of life. We refuse to accept that running away from storms, evacuating our families, suffering the devastation and misery, having to count our dead, become a way of life. We simply refuse to.